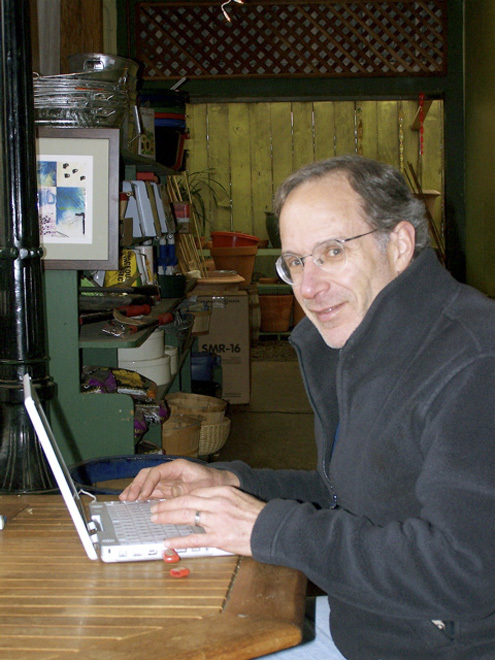 Writer Jonathan Rowe working at an open-air table in the front of Toby’s Coffee Bar in January 2008. I took the photo just after The Columbia Journalism Review published an article he had written about the ongoing faux pas of Robert Plotkin as publisher of The Point Reyes Light. He was now beginning a socio-economics commentary for Harpers. Point Reyes Station writer Jonathan Rowe, 65, died unexpectedly Sunday morning after being taken to a hospital Saturday. 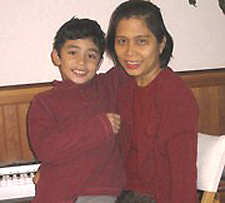 He leaves his wife Mary Jean Espulgar-Rowe and his son Joshua, a 3rd grader at West Marin School, both seen at right. His was a life of achievements: in writing and editing for major publications; in Washington, DC, politics; and in helping guide civic affairs here in West Marin. 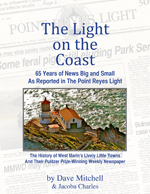 Mr. Rowe was a new member of the board of directors of the Marin Media Institute, which owns The Point Reyes Light. A 15-year resident of West Marin, he was also known here as the host of KWMR’s America Offline program. Mr. Rowe’s being an on-air interviewer was especially impressive because he had a severe speech impediment while growing up but overcame it as an adult. In addition, he co-founded the Tomales Bay Institute and its successor, the West Marin Commons project in Point Reyes Station. Last year, he contributed a thoughtful essay, Fellow Conservatives, to the Fall 2010 issue of the West Marin Review. In the article, “conservative” is used in the sense of conserving both nature and community traditions. Already, even before the cause of Mr. Rowe’s death has been made public, townspeople are talking of creating a memorial to him. A more civic-minded member of the community would be hard to find, and many of us are thinking of his family in this painful time. Those interested in reading any of Mr. Rowe’s writings on a variety of topics can find them by clicking here. Jon was a fellow early morning and long-standing “gym-rat” at the West Marin Fitness Center. We always greeted one another there or at the Bovine where we often “celebrated” after a workout. He was a pragmatic progressive, and a great way we can celebrate his life would be to dedicate a “Commons” area, such as the corner of Main and 4th Streets, to his memory. Town Commons were his passion, and it is so fitting that a great one is in the works, thanks to his vision. I was a fellow student of Jon when we both attended Tabor Academy in Marion, Mass, where we graduated together in 1963. He may have been the brightest person in our class of 112. I touched base with him again at Univ of Penna when he was law student. We were only casual friends, but I am surprised to hear of is sudden death. I worked with Jonathan Rowe in the 1970s when we both worked for Ralph Nader, primarily the Tax Reform Research Group (which published Jonathan’s newsletter PEOPLE AND TAXES). Never was there a man more devoted to the public good and to leaving this world a better place than he found it. He quoted me years later in the CHRISTIAN SCIENCE MONITOR, which I consider one of the great intellectual accomplishments of my life. Intelligent, thoughtful, caring, he was a man to be admired for many reasons. The world is indeed a better place for his having walked it, in his own gentle and loving way.